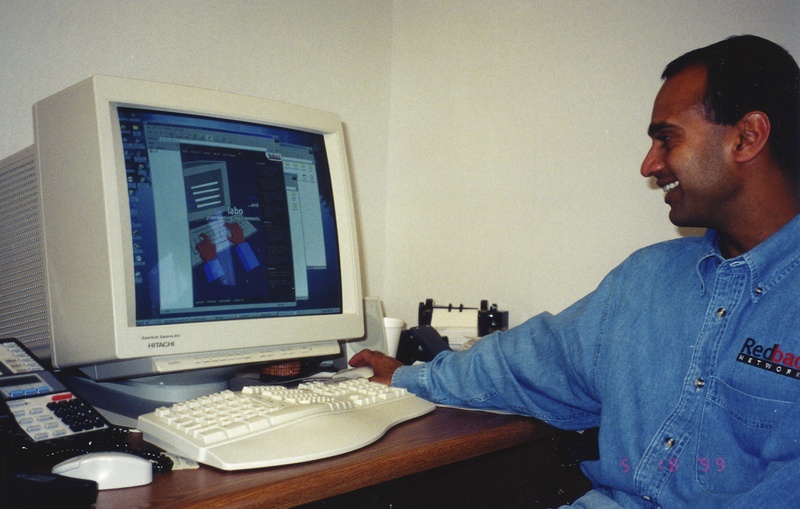 I founded Redback (formerly Nasdaq:RBAK) in 1996 with Asher Waldfogel, a colleague from Bay Networks (the merged company from SynOptics where we had both worked for several years) and Wellfleet. Ashar and I had been discussing multiple start-up ideas for months, and were fumbling around with a system to deliver video over broadband data networks when I realized that there was a looming existential hurdle to the deployment of broadband networking itself. At Bay Networks, we had struggled for a couple of years with the difficulty of merging routing technology, which is designed to connect data networks to data networks, with large scale switching technology designed to connect users to the data networks. I realized broadband would need to connect millions of users to the Internet core, a much larger scale but similar problem to the one we had uncovered at Bay for enterprise networks. 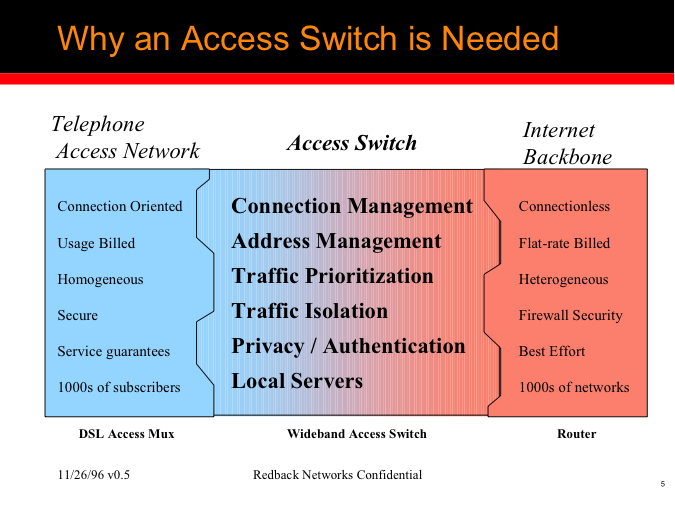 At the time Redback was conceived to fill this gap in 1996 (as shown in these two slides from our Series A fundraising presentation to Sequoia and Accel), the internet had less than 40 million users, the web had only seen 7 million unique users to date, a few thousand users worldwide had broadband connectivity to the home, and everyone believed that routers would connect users directly to the internet core. For the first year (1997) after our Series A funding, potential customers would squint at us as we described our proposition. 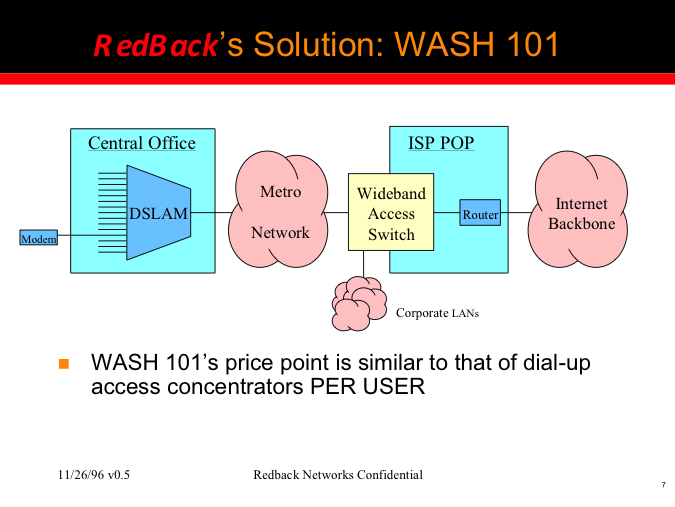 When the problem eventually manifested itself to Pacific Bell (in 1998) at a scale of just 300 DSL connections in San Francisco, Redback had the only solution. As broadband exploded around the world, we grew to almost $500 million in annualized revenue with several hundred telecom operator customers by late 2000, just four years after our initial venture funding, creating what today is a multi-billion dollar revenue product category.What is equally amazing to me is that the core functionality and network architecture we posited still essentially defines the category 18 years later. As relative unknowns, and first time entrepreneurs everything was hard for us. We had to recruit people in an environment rich in early stage networking systems start-ups, many of which are independent public companies today. Because raising money was tough, we had to innovate new ways to deliver - we took a risk and built the first Intel based appliance in the networking systems business. Today this is de rigueur. We were creating a product category that integrated multiple disciplines, and because of our financial constraints, or perhaps our mania, insisted on recruiting from only the top 5 people in the world in each of the disciplines. As a result, Redback shipped a telecom systems product with $5 million spent, and was profitable after spending $18 million in equity capital. We were scrappy because we had no choice. Redback went public early in the Internet bubble, and eventually hit a peak market capitalization of over $30 billion. We had been egalitarian in handing out equity, so many employees suddenly had astronomical paper wealth. Perhaps too many of us came from humble or poor backgrounds, and the flash of wealth disconnected many from the culture that had brought us success. This had predictable results – poor second generation products, a desire to conquer everything in sight, and the inability to focus or deliver anything new. And then the Telecom and Internet bubble burst, eventually taking the company to the brink of extinction. Fortunately, a new team resuscitated the company, growing the business back to $300 million +/year in revenue before Ericsson acquired Redback in early 2007 for $2.1 billion. I left Redback to join Sequoia Capital in mid 2001. Like all founders I was utterly transformed by my five years building a company from scratch into a real business with about 1200 employees and a half billion dollar annualized revenue run rate. I left because I realized that I truly enjoy the process of building from concept stage to category defining public company and working with a diverse set of people smarter and more driven than myself. Sequoia offered me the ability to do just that, and I continue to do so at Wing.